The San’in Kaigan Geopark has been growing various local products using its diverse and undulating terrain. In particular, the sea off the San’in region abounds with varied reefs, providing an environment accommodating to fish. 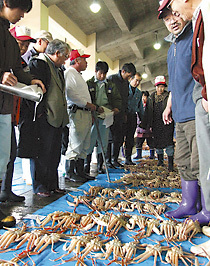 Blue crab fishing grounds lie in the waters at 200-400 meters below sea level between the coast and continental slope of the Japan Sea. At deeper water levels, red snow crabs are caught. The Japan Sea at a level deeper than 200 m is filled with cold water known as the “Japan Sea proper water,” with the Tsushima Warm Current circulating in the surface layer. As a result, its medium layers and deep sea are inhabited by such cold-water fish species as sandfish and porous-head eelpout, and its surface layer by warm-water species such as bluefin tuna and flying fish. In the Yamato Basin located almost at the center of the Japan Sea, the Tsushima Warm Current merges with the cold middle-layer water mass, creating major fishing grounds of such species as snow crab, flathead flounder, and kurozakoebi (Argis lar). 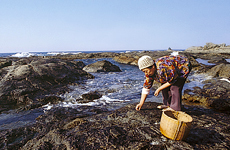 The Geopark contains the San’in region’s leading fishing grounds, where species such as snow crab and kurozakoebi (Argis lar) are caught. Compared to the Pacific region, fish species are more diverse in the Japan Sea, and so we can enjoy delicious fish of each season all through the year. In the Geopark, there are also many hot springs along the faults. Among them, Kizu Onsen (Kyoto Prefecture), Kinosaki Onsen and Yumura Onsen (Hyogo Prefecture), and Iwai Onsen (Tottori Prefecture) are particularly outstanding spa resorts that are over 1,000 years old and have always been loved by distinguished people. There are some episodes concerning the discoveries of these hot springs, which are unique to this snow-bound region. 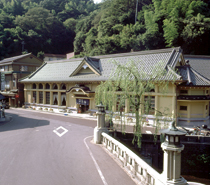 Together with their histories, the widely scattered hot spring resorts make the entire region a major tourist area. 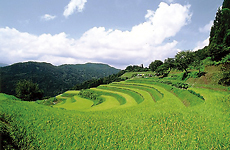 In the Hachibuse area, a major landslide region comprising the Hokutan Group and Teragi Group, one can enjoy various attractions, such as landscapes of terraced rice paddies using the area’s geomorphological features, skiing in winter, and paragliding and grass skiing in summer. Mt. Kannabe, a Quaternary volcano with a slope gradient ranging from 20 to 30 degrees, is also used as a ski slope. There are other activities that make the most of the San’in region’s geomorphological and geological features, such as seaweed picking on the wave-cut benches and making terraced rice paddies on the coastal terraces. In the San’in Kaigan Geopark, efforts are being made toward the creation of a sustainable local community by conserving the region’s geological heritage and other resources through concerted efforts of local people, private organizations, companies, and government, and by utilizing such heritage and resources for education, tourism, and local industries. In the Tottori Sand Dunes, desert afforestation research is conducted under the leadership of the Arid Land Research Center, Tottori University. Also, sand dune rakkyo is grown extensively, making the best of its geological advantages. Every year, from late October to early November, purple-red rakkyo flowers bloom in the vast, 110-hectare field. 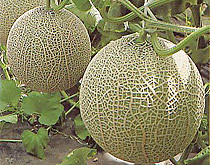 In the Tango Sand Dunes, Kyotango City, fruits are grown extensively on the sand dunes. In summer, fruits with high sugar content, such as watermelon and melon, are harvested. 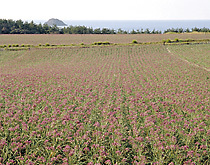 A brand-name sweet potato known as “Kyokansho” is also produced here.